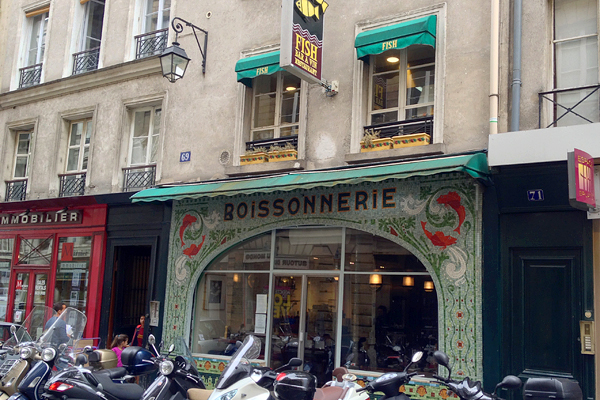 After reading so many great reviews of Fish la Boissonnerie in Paris’s Latin Quarter, we knew that we couldn’t miss it. We made plans to go for lunch for two reasons: we needed to fuel up before a walk to the Louvre, and lunch is generally much more affordable than dinner. We arrived for lunch at 12:15, about fifteen minutes before opening, and waited outside, so as not to lose our spot at the front of the line. During the wait, we enjoyed takeout coffees from the PAUL Bakery down the street as the Fish employees frantically dashed back and forth across the street to print out the day’s menu. Our early arrival was completely worth the wait. We scored the high table at the front window, providing us with both height to survey the rest of the dining room and excellent people watching out on the street. Menus are available in English, and our server spoke perfect English as well, making ordering a snap. 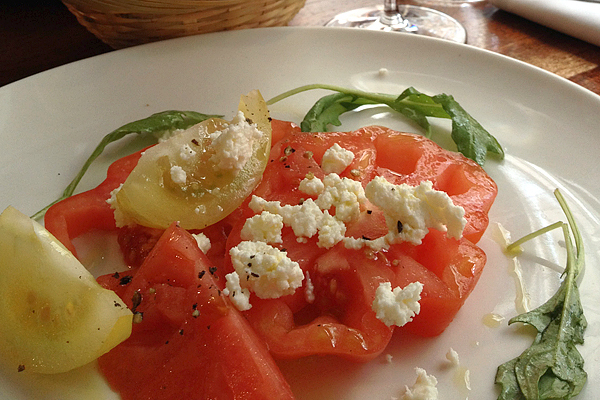 I started with the vegetarian tomato and ricotta salad, which was wonderfully fresh and juicy, accented with salt, pepper, and crumbles of rich ricotta. 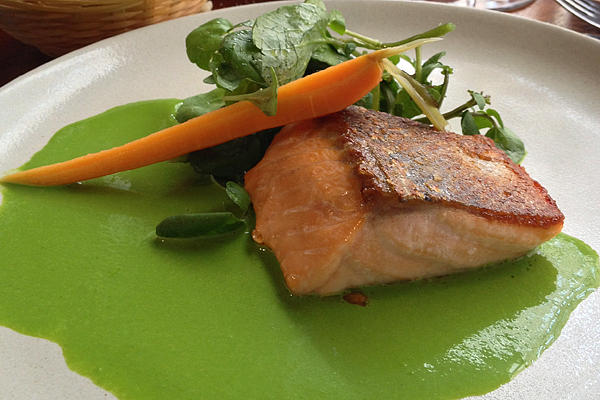 My main course was a seared salmon with a steamed carrot, greens, and an herb sauce. The salmon was perfectly cooked, and the seared saltiness was a great complement to the fresh herbs and vegetables. Paired with a glass of sauvignon blanc, a lovely window view, and a handsome dining companion, lunch doesn’t get much better than this. 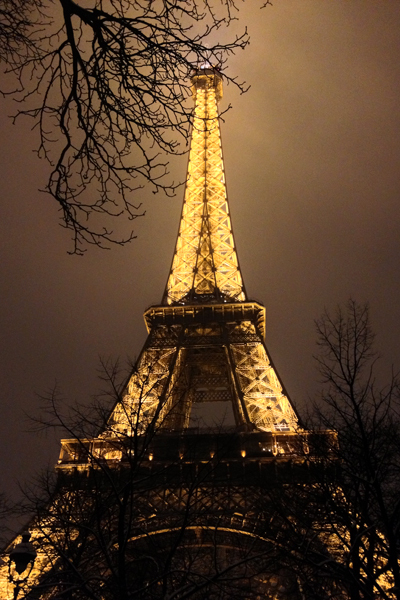 Though Paris is generally a gluten-ful city, careful research can lead you to safe and healthy gluten-free food throughout the city. In addition to the spots that I have reviewed, I highly recommend visiting Helmut Newcake, which is everything one could want from a completely gluten-free bakery and café. Pizza and burgers, in addition to a daily pastry spread, make for a complete, satisfying meal. Our quick end-of-day visit to Helmut Newcake didn’t do the bakery justice, and I can’t wait to visit again, this time at a more leisurely pace. Where? 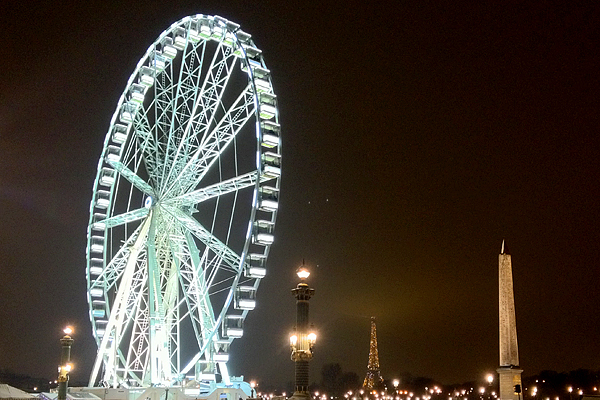 Fish La Boissonnerie is located in Paris’s 6th arrondissement: 69 Rue de Seine, Paris 75006 (+33-1-43-54-34-69).